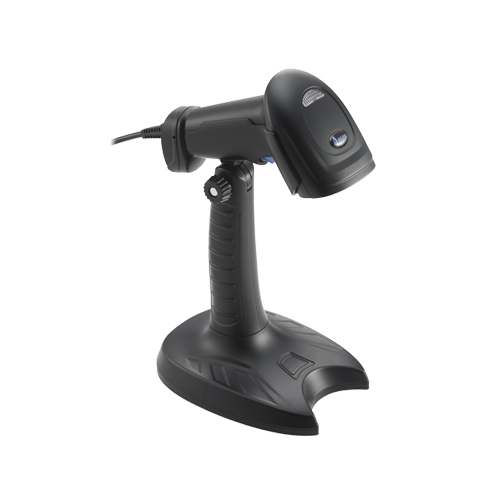 The AS9300 Series Barcode Imager is designed for Office or Point of Sale use. AS-9300 is the new generation of 2D barcode scanner. Quad-core chip technology and powerful scan engine with excellent performance highly increase the reading capability. Damaged barcodes, dirty barcodes and illegible barcodes can be read easily. 2D barcodes are used widely nowadays, for example QR Code for the ticket information, PDF417 on the flight tickets and ID cards. AS-9300 also can capture the barcodes information fast and accurately from LCD screen or mobile phone screen. A hand-free stand is included in the box. The USB Model is normally used to add a barcode "front end" to existing applications. If these applications normally accept input from the keyboard, this scanner enables use of barcodes without any software modification. Data from the scanned barcodes appears as though it was entered on the keyboard. Configuration:     Via Scanning Barcode Menus. Complete Manual provided. Power:             The USB models derive their power from the PC.